Camp Trails Ponderosa is the best pack I have ever used and I have had a more than a handful of other packs to compare with. I chucked away my first one after many years use when one of the zippers failed and regretted it afterwards and have this week bought two more on eBay and will never look back on softpacks again. I cannot wait to finally get them. Top weave, robust frame, light and roomy. I have used it around the world from Lappland, Nova Scotia, Rockies, and New Zealand and it has worked everywhere. It is easy to adjust the frame and shape with the extra plugholes at the straps. The straps could be a little wider, but I have carried 35 kg over a two-week period and had no problems and the hip belt is more nimble then the oversized ones that comes with the newer packs. The 65+ liter capacity is just right for long weekends and even up to two-week long walks with two extra bags for the tent and sleeping bag. If it is any bigger you end up lugging things you do not need and definitely do not want to carry. The frame provides superb structural support and the pack open up really well to enable good distribution and law and order when you pack which helps getting a well balanced pack. The weave on my first one lastad 20 years without a scratch, but eventually one of the zippers failed and the frame is the strongest I have experienced. 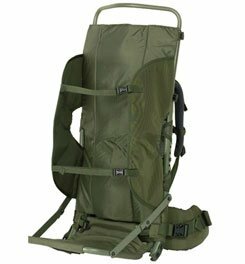 Camp Trails has stopped producing them but I found a similar looking frame pack with around 65 liters from Kelty that might be worth testing out. 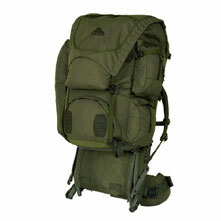 I have a Kelty 110 and they make good packs too. I missed being able to fit skis and an ice axe, but will add these features manually to the bags once I get the new ones. Once in a while you come across a top product that no other does better and Camp Trails Ponderosa or Haute Route are among those. Thanks for the review, Mikael. Would you happen to have a picture of your pack? We'd love to see it. Welcome to Trailspace and thanks for the review, Mikael! I'd also love to see some pictures of your old and new-old packs. My first overnight pack was a Camp Trails. I think I had one of these too.... Does it look like.... http://eksjotorget.se/annons/2307449/ryggsack_camp_trails_ponderosa ?? I have an old Camptrails pack too. Not sure of the model but it is one of the larger ones. Purchased April 9, 1974 -- I still have the receipt. With a few trips to the shoemaker to sew in some Cordura, it is still usable. These packs are made of iron. To stay in shape, I put 50 lbs of free weights in it, raise my treadmill to 15 degrees, put a 5 lb weight on each ankle and cover a mile in about 18 minutes. The divide between the top and bottom compartments is still holding up. Thanks for your review, Bob. Wow, that's some serious weight carrying, Bob! I'd love to see some pictures of your old Camp Trails pack in your review, if you're willing to add a few. The Camp Trails Ponderosa is not available from the stores we monitor.